Rambling on about nothing much since 2006! Why, oh why, do I let myself get caught out every Christmas?! It seems that, as well as over-spending on presents for the family, I should really be putting money aside for the inevitable Christmas breakdown, too ... in addition to my hob's attempt to cook the worktop, my washer-dryer has given up the ghost for the fifth time!! Ironically, the insurance company contacted me back in November to ask how it was doing and I told them it was doing fine, so they sent me the paperwork to apply for another year's insurance ... I think they thought they weren't going to have to pay out! So, it looks like I'm going to spend another couple of weeks wearing old clothes I hardly wear because I can't get them washed ... good job I haven't been able to take them down to the charity shop yet, otherwise, I would need to buy them back! With all this, the almost-full credit card, the holidays being planned for the new year and the long list of gadgets I keen to get my grubby mitts on, perhaps I should have accepted the job offer the boss made. 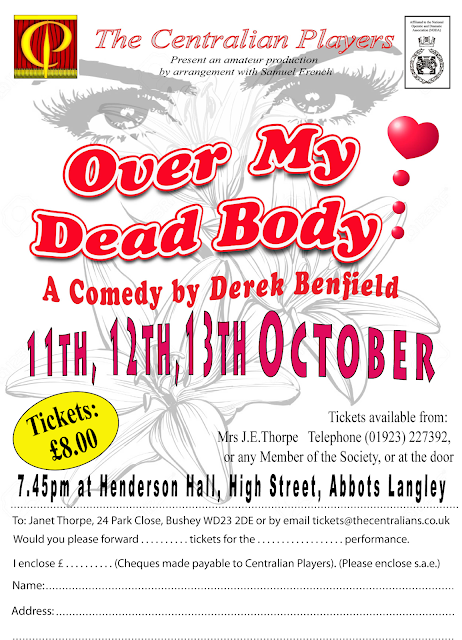 It's that time of year again when The Centralian Players are building up to their final production of the year, this time performing Over My Dead Body, by the late playwright and actor, Derek Benfield. The play centres around Gerald, recently widowed, who plans to spend the rest of his days alone with his memories, not realising his late wife had other plans! With the help of his daughter and son-in-law, Gerald does his best to keep unexpected visitors at bay and maintain his independence, but memories revive events from the past which are both funny and sad. For those who enjoyed Steve Barker's debut as a playwright with his production of Awkward!, you will be pleased to hear he has been bashing away in front of his computer for the past year and is about to release his second play on an unsuspecting public. 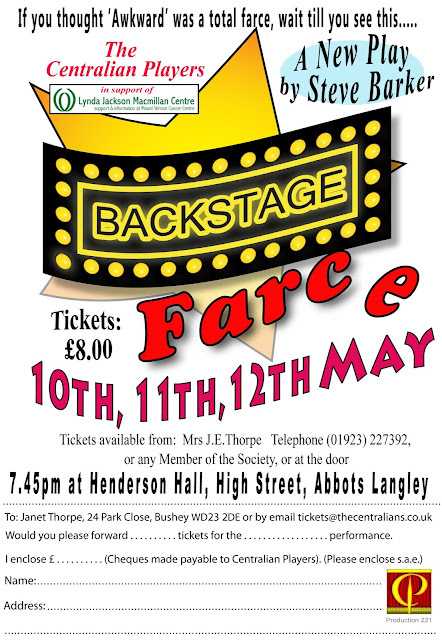 Backstage / Farce is a two-act play about a local drama group, the Bluebell End Players, who are preparing for - and performing - the opening night of their production, A Bit of Slap and Tickle. As you may expect from a farce, things do not go according to plan as the group battle their way through frayed tempers, bad nerves, and missing cast members! Last year was a tough one, in so many ways, and I have yet to be convinced that this year will be better, but we will see. However, in an effort to find something other than work to fill my time and get some of my previous enjoyment of life back, I have returned to the Centralian Players - admittedly after some encouragement from various quarters. In 9 days - Thursday, 26 January 2017, to be more specific - I will once again be appearing on stage at Henderson Hall in Abbots Langley, in a never-before-seen production, titled 'Awkward!'. The script has been penned by our very own Steve Barker and everyone is hoping that it will eventually be published for other groups to perform. To summarise the plot, think of that moment when your tongue rattled something off before your brain could hold it in check. Or that situation where you have to converse with someone you have nothing in common with. Or that moment a piece of clothing let your modesty down. We've all had them. Odd Thomas Odd Blog by Richard Coleman is licensed under a Creative Commons Attribution-NoDerivatives 4.0 International License. Additional copyrights and trademarks are properties of their respective owners.